Looting and scuffles with police are being witnessed in several states across Mexico, as protests erupt amid a 20 percent fuel price hike. More than 150 people have been detained, with dozens of shops suffering damage, and highways blocked. The 20.1 percent hike was announced on January 1, AFP reports. It immediately led to coordinated action in the central states of Mexico, Hidalgo, and Michoacan. There, the National Association of Self-Service and Department Stores reported 79 shops looted and more than 170 blocked. There were 161 arrests across six municipalities in the state of Mexico – 35 of them minors – for “various acts of vandalism and thefts at shops,” according to AFP. Mexico City Mayor Miguel Angel Mancera said 64 arrests were made in the capital alone. At least 23 shops were looted in the capital. According to media reports, the groups looting the stores were using motorcycles and pickup trucks to make off with stolen goods. President Enrique Pena Nieto defended the increase in price, saying it was precipitated by a global oil price hike. On Wednesday, 20 more protests erupted across Mexico in the course of the day, federal police reported. 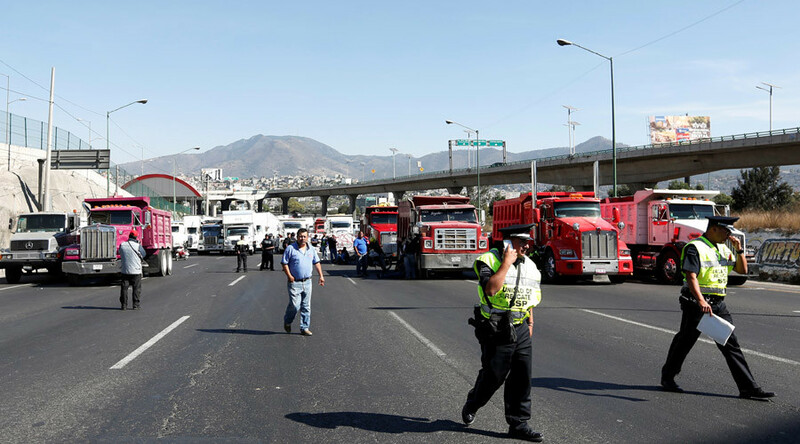 The blockades affected the distribution of fuel on Tuesday, the state energy company Pemex said, following the price hike. The company called the situation “crucial” in the northern states of Chihuahua and Hidalgo, and said they threatened the operation of airports in Chihuahua and in Baja California.